"Violent storm" redirects here. For the videogame, see Violent Storm. The Beaufort scale /ˈboʊfərt/ is an empirical measure that relates wind speed to observed conditions at sea or on land. Its full name is the Beaufort wind force scale. The scale was devised in 1805 by the Irish hydrographer Francis Beaufort (later Rear Admiral Sir Francis Beaufort), a Royal Navy officer, while serving on HMS Woolwich. 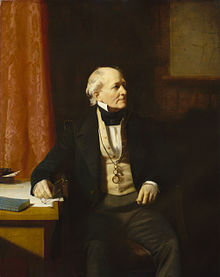 The scale that carries Beaufort's name had a long and complex evolution from the previous work of others (including Daniel Defoe the century before) to when Beaufort was Hydrographer of the Navy in the 1830s when it was adopted officially and first used during the voyage of HMS Beagle under Captain Robert FitzRoy, later to set up the first Meteorological Office (Met Office) in Britain giving regular weather forecasts. In the early 19th century, naval officers made regular weather observations, but there was no standard scale and so they could be very subjective – one man's "stiff breeze" might be another's "soft breeze". Beaufort succeeded in standardising the scale. The scale was made a standard for ship's log entries on Royal Navy vessels in the late 1830s and was adapted to non-naval use from the 1850s, with scale numbers corresponding to cup anemometer rotations. In 1916, to accommodate the growth of steam power, the descriptions were changed to how the sea, not the sails, behaved and extended to land observations. Rotations to scale numbers were standardized only in 1923. George Simpson, CBE (later Sir George Simpson), director of the UK Meteorological Office, was responsible for this and for the addition of the land-based descriptors. The measure was slightly altered some decades later to improve its utility for meteorologists. Today, many countries have abandoned the scale and use the metric system based units, m/s or km/h, instead, but the severe weather warnings given to the public are still approximately the same as when using the Beaufort scale. data graphic showing Beaufort wind force scale in scale units, knots, and meters/second. Calm < 1 knot 0 ft Sea like a mirror Smoke rises vertically. Light air 1–3 knots 0–1 ft Ripples with appearance of scales are formed, without foam crests Direction shown by smoke drift but not by wind vanes. Light breeze 4–6 knots 1–2 ft Small wavelets still short but more pronounced; crests have a glassy appearance but do not break Wind felt on face; leaves rustle; wind vane moved by wind. Gentle breeze 7–10 knots 2–4 ft Large wavelets; crests begin to break; foam of glassy appearance; perhaps scattered white horses Leaves and small twigs in constant motion; light flags extended. Moderate breeze 11–16 knots 3.5–6 ft Small waves becoming longer; fairly frequent white horses Raises dust and loose paper; small branches moved. Fresh breeze 17–21 knots 6–10 ft Moderate waves taking a more pronounced long form; many white horses are formed; chance of some spray Small trees in leaf begin to sway; crested wavelets form on inland waters. Strong breeze 22–27 knots 9–13 ft Large waves begin to form; the white foam crests are more extensive everywhere; probably some spray Large branches in motion; whistling heard in telegraph wires; umbrellas used with difficulty. near gale 28–33 knots 13–19 ft Sea heaps up and white foam from breaking waves begins to be blown in streaks along the direction of the wind; spindrift begins to be seen Whole trees in motion; inconvenience felt when walking against the wind. fresh gale 34–40 knots 18–25 ft Moderately high waves of greater length; edges of crests break into spindrift; foam is blown in well-marked streaks along the direction of the wind Twigs break off trees; generally impedes progress. Strong/severe gale 41–47 knots 23–32 ft High waves; dense streaks of foam along the direction of the wind; sea begins to roll; spray affects visibility Slight structural damage (chimney pots and slates removed). whole gale 48–55 knots 29–41 ft Very high waves with long overhanging crests; resulting foam in great patches is blown in dense white streaks along the direction of the wind; on the whole the surface of the sea takes on a white appearance; rolling of the sea becomes heavy; visibility affected Seldom experienced inland; trees uprooted; considerable structural damage. Violent storm 56–63 knots 37–52 ft Exceptionally high waves; small- and medium-sized ships might be for a long time lost to view behind the waves; sea is covered with long white patches of foam; everywhere the edges of the wave crests are blown into foam; visibility affected Very rarely experienced; accompanied by widespread damage. Hurricane force  ≥ 64 knots ≥ 46 ft The air is filled with foam and spray; sea is completely white with driving spray; visibility very seriously affected Devastation. The Beaufort scale is not an exact nor an objective scale; it was based on visual and subjective observation of a ship and of the sea. The corresponding integral wind speeds were determined later, but the values in different units were never made equivalent. The scale is used in the Shipping Forecasts broadcast on BBC Radio 4 in the United Kingdom, and in the Sea Area Forecast from Met Éireann, the Irish Meteorological Service. Met Éireann issues a "Small Craft Warning" if winds of Beaufort force 6 (mean wind speed exceeding 22 knots) are expected up to 10 nautical miles offshore. Other warnings are issued by Met Éireann for Irish coastal waters, which are regarded as extending 30 miles out from the coastline, and the Irish Sea or part thereof: "Gale Warnings" are issued if winds of Beaufort force 8 are expected; "Strong Gale Warnings" are issued if winds of Beaufort force 9 or frequent gusts of at least 52 knots are expected. ; "Storm Force Warnings" are issued if Beaufort force 10 or frequent gusts of at least 61 knots are expected; "Violent Storm Force Warnings" are issued if Beaufort force 11 or frequent gusts of at least 69 knots are expected; "Hurricane Force Warnings" are issued if winds of greater than 64 knots are expected. This scale is also widely used in the Netherlands, Germany, Greece, China, Taiwan, Hong Kong, Malta, and Macau, although with some differences between them. Taiwan uses the Beaufort scale with the extension to 17 noted above. China also switched to this extended version without prior notice on the morning of 15 May 2006, and the extended scale was immediately put to use for Typhoon Chanchu. Hong Kong and Macau retain force 12 as the maximum. In the United States, winds of force 6 or 7 result in the issuance of a small craft advisory, with force 8 or 9 winds bringing about a gale warning, force 10 or 11 a storm warning ("a tropical storm warning" being issued instead of the latter two if the winds relate to a tropical cyclone), and force 12 a hurricane-force wind warning (or hurricane warning if related to a tropical cyclone). A set of red warning flags (daylight) and red warning lights (night time) is displayed at shore establishments which coincide with the various levels of warning. Huler, Scott (2004). Defining the Wind: The Beaufort Scale, and How a 19th-Century Admiral Turned Science into Poetry. Crown. ISBN 1-4000-4884-2. ^ a b "National Meteorological Library and Archive Fact sheet 6 — The Beaufort Scale" (PDF). Met Office. Archived from the original (PDF) on 2 October 2012. Retrieved 13 May 2011. ^ Oliver, John E. (2005). Encyclopedia of world climatology. Springer. ^ Walter J. Saucier (1955). Principles of Meteorological Analysis. Retrieved on 2009-01-09. ^ Tom Beer (1997). Environmental Oceanography. CRC Press. ISBN 0-8493-8425-7. ^ Maiden, Terence. "T-Scale: Origins and Scientific Basis". TORRO. Archived from the original on 5 February 2012. Retrieved 4 January 2012. ^ a b The names "storm" and "hurricane" on the Beaufort scale refer only to wind strength, and do not necessarily mean that other severe weather (for instance, a thunderstorm or tropical cyclone) is present. To avoid confusion, strong wind warnings will often speak of e.g. "hurricane-force winds". ^ "Beaufort wind force scale". Met Office. Retrieved 27 November 2015. ^ "Beaufort Scale". Royal Meteorological Society. Retrieved 27 November 2015. ^ "Beaufort Scale". Encyclopædia Britannica. Retrieved 27 November 2015. ^ "Wetterlexikon - Beaufort-Skala" (in German). Deutscher Wetterdienst. Archived from the original on 12 December 2013. Retrieved 2014-02-14. Wikimedia Commons has media related to Beaufort Scale. Wikisource has the text of the 1911 Encyclopædia Britannica article Beaufort Scale. National Meteorological Library and Archive fact sheet on the history of the Beaufort Scale, including various scales and photographic depictions of the sea state. This page was last edited on 24 April 2019, at 07:08 (UTC).